One of the works on display as part of the Jonathan Hobin show Little Lady/Little Man at the City Hall Art Gallery. Jonathan Hobin’s new exhibition of life-sized photographs of his aged grandparents is, frankly, one of the best shows by a local artist to hit this city in the past year. But that shouldn’t be surprising. Hobin’s last major body of work, a series of staged photographs of children re-enacting dark scenes from myth and reality, was eye-popping, memorable and, yes, disturbing. The new exhibition, on view at at Ottawa City Hall Gallery, is called Little Lady/Little Man. 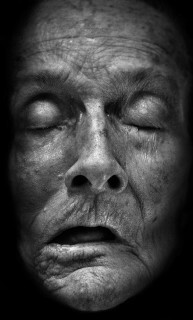 A series of photographs on aluminum show how the years have ravaged the bodies of Hobin’s grandparents, William Horace Merrill and the former Marjorie Ann Cory. 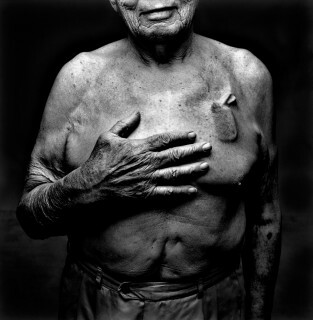 The old couple wear their scars and sagging flesh with dignity and stoicism. The showstopper is The Deathbed, a photograph of Hobin’s grandmother literally on her deathbed. The life-sized photograph is presented horizontally upon a flat surface. Visitors look down upon her, as if they were visiting grandma in a hospital. The Deathbed is reminiscent of a Ron Mueck sculpture Old Woman in Bed that was included in the Australian artist’s solo show in 2007 at the National Gallery of Canada. Mueck’s work goes beyond being realistic to being hyper-realistic. The same could be said for Hobin. Indeed, the entire Hobin show is what Mueck would deliver if he decided to start photographing real people instead of creating them in his studio. There were compliments all around at the recent vernissage of Hobin’s show, not just for the artist’s work but for the spectacular way the exhibition was arranged and lighted by the city’s Julie Dupont and her crew. Rest Your Heart by Jonathan Hobin. There was a sense of magic in the gallery that evening as members of Ottawa’s visual arts royalty oohed and ahhed. They included such artists as Jerry Grey, Michele Provost, and Claude Marquis (who has returned to painting while still leading musical sensation The Peptides), Hobin’s former dealer Dale Smith, Sandra Dyck (curator of the Carleton University Art Gallery), and collectors par extraordinaire Glenn and Barbara McInnes. 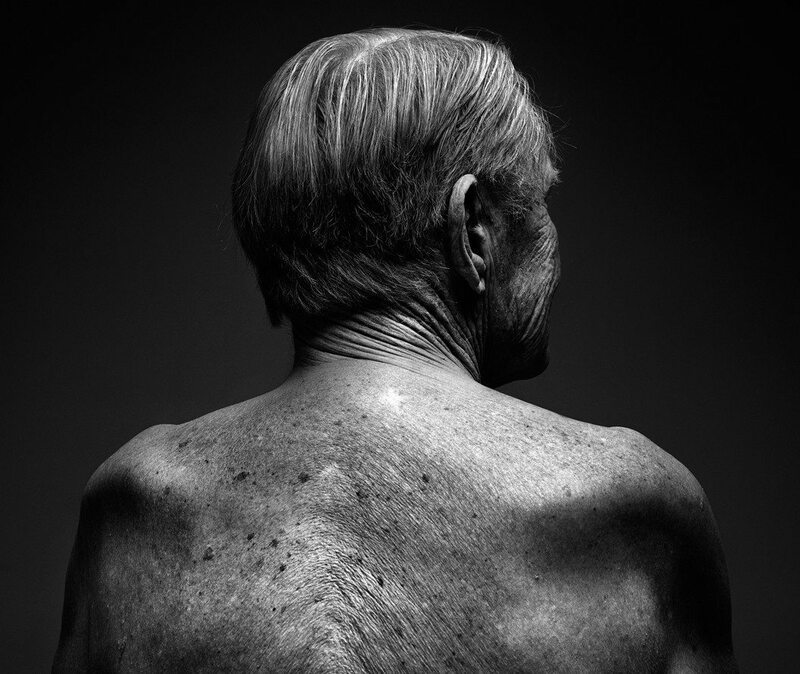 There will inevitably be some people unhappy with Hobin’s work, believing it to be voyeuristic, sensationalistic, and exploitative of his own aged kin. But such critics are wrong. This is a work of love. Old people should not be hidden away. And neither should photographs of them. Hobin and his grandparents were brave to collaborate on this excellent body of work. Little Lady/Little Man is on view at the City Hall Art Gallery until April 29. Listen to clip of Hobin’s grandfather singing a lullaby that he used to sing to his girls here. The recordings form part of the exhibition.